• Find out your state's adult immunization rates and how they compare with others' rates and with national goals. • Stay abreast of changes in adult immunization schedules. • Acknowledge existing health care disparities in immunization rates. • Teach patients about the importance of immunization. If you haven't already completed the pre-Compass Questions, please click here. It's summertime and static high-pressure areas, depending on the position of the jet stream, are spawning heat waves across the country. Consider this to be a great time to get "fired up" about improving our nation's immunization rates for vaccine-preventable diseases. While this national health observance was initially linked to the back-to-school mindset, it now is broadly focused on both childhood and adult immunization. Because of the particular health care gaps that exist and the lesser attention often paid to the topic (compared to immunization in children), this Compass Points™ focuses on immunization in adults, with special focus on influenza and pneumococcal vaccination and disparities in their rates among older adults and ethnic minorities. But first, a few general pearls about why immunization is a national health care priority. Vaccines are among the most cost-effective, illness prevention strategies. Both the effectiveness and return on investment of vaccination programs are high. For example, for each birth cohort vaccinated according to the routine immunization schedule, we save 33,000 lives, prevent 14 million cases of disease, and reduce direct and indirect health care costs by $9.9 billion and $33.4 billion, respectively. (1) These are staggering statistics that underscore how immunization reduced infectious disease mortality and contributed to the increase in life expectancy seen during the 20th Century. But now we are in the 21st Century, and despite progress, approximately 42,000 adults and 300 children in the United States die each year from vaccine-preventable diseases(1) and pockets of undervaccinated populations are at increased risk for outbreaks of vaccine-preventable diseases. These figures relate to the fact that immunization is underappreciated and underperformed in the United States. Specifically, vaccination rates for US adults for routine vaccines are below national targets, as outlined by Healthy People 2010(2) and Healthy People 2020(3) (more on specific figures in the next section). Even with all these gaps and barriers acknowledged, the call to action to improve immunization rates in adults still exists. As a clinician, a parent, a neighbor, or a friend, you can take some take action with some initial steps to answer the call. Read on. Find out your state's adult immunization rates and how they compare with others' rates and with national goals. For most of us, taking action requires some unforeseen or predisposing event that jolts us into a state in which our propensity to act is heightened. Often, this is a patient encounter associated with significant morbidity and mortality. Luckily, such encounters are rare for our most serious, vaccine-preventable diseases; most clinicians have not seen significantly morbid or fatal cases of the most common vaccine-preventable diseases. Therefore, an alternate impetus may come from looking at how your state is doing with immunization rates alongside the national goals outlined in Healthy People 2020. (3) Take the time to look at the most recent data from the National Immunization Survey (NIS), the National Health Interview Survey (NHIS), and the Behavioral Risk Factor Surveillance System (BRFSS). Find these by visiting the page entitled "Vaccination Coverage in the U.S." at http://www.cdc.gov/vaccines/stats-surv/default.htm. To locate your state's coverage data, visit the Health Indicators Warehouse at http://healthindicators.gov/ and select "Prevention Through Healthcare/Immunizations," and then the vaccination of interest and your state. The maps below show execution of that query for influenza and pneumococcal vaccination rates in adults aged 65 and over (see Figures 1 and 2). (7,8) How do your state's rates compare with rates of other states? How do your state's rates compare to the national average and to Healthy People 2020 goals featured in Table 2? Stay abreast of changes in adult immunization schedules. Being knowledgeable of the latest recommendations will enable you to be a strong advocate for immunization efforts in adults. The Advisory Committee on Immunization Practices (ACIP) at the CDC reviews immunization schedules annually to ensure that they reflect current recommendations for licensed vaccines. The current 2011 schedule for adults was approved in October 2010, and had several changes from the previous version; it was published in detail in the Morbidity and Mortality Weekly Report (MMWR) for February 4, 2011. (10) Table 3 briefly outlines these changes. Acknowledge existing health care disparities in immunization rates. Health care disparities are often more pronounced in older people. For adults aged 65 and over, in 2009, only 44.8% of blacks and 40.1% of Hispanic persons reported "having ever received a pneumonia shot," compared with 64.9% of their white counterparts reporting vaccination. The 2008 rates in pneumococcal vaccination reported in older Americans of Asian descent were 46.3%. (12) According to the American Association of Retired Persons (AARP), some reasons associated with racial and ethnic immunization disparities among Medicare beneficiaries include providers' underestimation of the safety and efficacy of the vaccines, lack of familiarity with age-based immunization recommendations, and failure to recommend age-appropriate immunizations to older adults. (13) By knowing about these disparities, you can develop and implement innovative strategies to improve care and increase vaccination rates in these patient populations. Teach patients about the importance of immunization. In Latin, doctor means teacher, from docere, meaning "to teach." As clinicians, we must educate patients about the importance of immunization. By educating others, we reinforce our own clinical knowledge and competence. If you need help, useful tools are available at the vaccination-related pages of the Centers for Disease Control (CDC) website at http://www.cdc.gov/vaccines/ and the Healthfinder.gov website at http://www.healthfinder.gov. You can even send out health e-cards to spread the word at http://www.healthfinder.gov/ecards/DisplayCard.aspx?CardID=22 and download a toolkit related to National Vaccine Awareness Month at http://www.healthfinder.gov/nho/augtoolkit.aspx. A part of teaching will no doubt mean that you will encounter patients who are hesitant to accept or who will refuse vaccination. Germane to your role will be to handle their objections in an empathetic, but assertive, manner and to provide balanced information. For objections about safety, it will be important to dispel myths by providing evidence-based information. Common myths and misconceptions center around thoughts that immunizations 1) are just for children; 2) do more harm than good; and 3) are not needed because the diseases they protect against have already been eradicated. (4,5) For objections about cost, note that under the Affordable Care Act, if the patient was enrolled in a new health plan on or after September 23, 2010, that plan is required to cover recommended preventive services—including recommended immunizations—without requiring the patient to pay a deductible amount, copayment, or coinsurance. (14) And, of course, Medicare covers influenza and pneumococcal vaccination for its beneficiaries. Answering this call to action is imperative. And there is no doubt that medical homes will be integral to delivery of comprehensive adult preventive health care, including immunization. Indeed, medical homes are designed to offer continuous, comprehensive, accessible primary care, a construct that should alleviate some of the barriers to immunization. I hope this article is informative and prompts you to think carefully about vaccine-preventable disease. Then, take action to increase your immunization rates. The plans for action that you make this August will improve your care of patients…not just today and tomorrow, but for the future. Your responses to this issue's Compass Questions™ will be added to an ongoing needs assessment for educational programming in this important area. Responses to this issue's questions will be reported in an upcoming issue. Now that you have read this article, how familiar are you with updates contained in the current 2011 ACIP Adult Immunization Schedule? Now that you have read the article, how often do you PLAN to check immunization status during annual exam visits you conduct with patients ages 65 and over? Will you commit to identifying the estimated vaccination rates for influenza and pneumococcal disease, in adults, for the state in which you practice or live by the end of August (Immunization Awareness Month) or by the end of the year? Centers for Disease Control and Prevention. Ten great public health achievements--United States, 1900-1999. MMWR Morb Mortal Wkly Rep. 1999;48(12):241-243. PMID: 10220250. Department of Health and Human Services. Health People 2010 midcourse review: immunizations and infectious diseases. HealthyPeople.gov Website. http://www.healthypeople.gov/2010/data/midcourse/pdf/fa14.pdf. Accessed August 5, 2011. Department of Health and Human Services. Healthy People 2020 topics & objectives: immunizations and infectious diseases. HealthyPeople.gov Website. http://www.healthypeople.gov/2020/topicsobjectives2020/objectiveslist.aspx?topicId=23. Accessed July 30, 2011. Trust for America's Health, Infectious Disease Society of America, Robert Wood Johnson Foundation. Adult immunization: shots to save lives. February 2010. http://healthyamericans.org/assets/files/TFAH2010AdultImmnzBrief13.pdf. Accessed August 5, 2011. Centers for Disease Control and Prevention. WhatWorks! 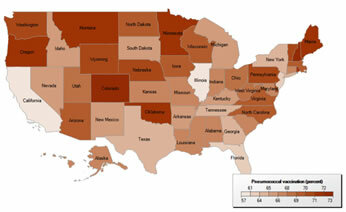 : increasing adult vaccination rates. Revised May 25, 2010. http://www.cdc.gov/vaccines/recs/rate-strategies/adultstrat.htm. Accessed August 5, 2011. Task Force onCommunity Preventive Services. Vaccine-preventable diseases: improving vaccination coverage in children, adolescents, and adults. A report on recommendations of the Task Force on Community Preventive Services. MMWR Morb Mortal Wkly Rep. 1999;48(RR-8):1-15. National Center for Health Statistics. Flu vaccination, adults (percent) [database]. Health Indicators Warehouse Website. 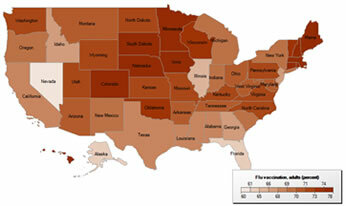 http://healthindicators.gov/Indicators/Flu-vaccination-adults_119/National_0/Profile/Data. Accessed July 30, 2011. National Center for Health Statistics. Pneumococcal vaccination (percent) [database]. Health Indicators Warehouse Website. http://healthindicators.gov/Indicators/Pneumococcal-vaccination_118/National_0/Profile/Data. Accessed July 30, 2011. Centers for Disease Control and Prevention. Vaccination coverage estimates from the National Health Interview Survey: United States, 2008: National Center for Health Statistics Website. http://www.cdc.gov/nchs/data/hestat/vaccine_coverage/vaccine_coverage.pdf. Revised June 8, 2011. Accessed July 30, 2011. Centers for Disease Control and Prevention. Recommended adult immunization schedule--United States, 2011. Morb Mortal Wkly Rep. 2011;60(4):1-4. PMID: 21381442. Department of Health and Human Services. 2010 National Healthcare Disparities Report. AHRQ Publication No. 11-0005. Agency for Healthcare Research and Quality Website. http://www.ahrq.gov/qual/nhdr10/nhdr10.pdf. Published March 2011. Accessed July 30, 2011. Centers for Disease Control and Prevention. Statistics and surveillance: 2009 adult vaccination coverage--The National Health Interview Survey. CDC Website. http://www.cdc.gov/vaccines/stats-surv/nhis/2009-nhis.htm. Reviewed November 17, 2010. Accessed July 30, 2011. Flowers L, Sinclair S-A, Figueiredo C, Umans B, O'Leary S; for the American Association of Retired Persons Public Policy Institute.Racial and ethnic disparities in influenza and pneumococcal immunization rates among medicare beneficiaries. Insight on the Issues. http://assets.aarp.org/rgcenter/ppi/health-care/i12r-flu.pdf. Published January 2010. Accessed July 30, 2011. Department of Health and Human Services. Affordable Healthcare Act Implementation Center-Regulations: Recommended preventive services. Healthcare.gov Website. http://www.healthcare.gov/center/regulations/prevention/recommendations.html. Accessed July 30, 2011.